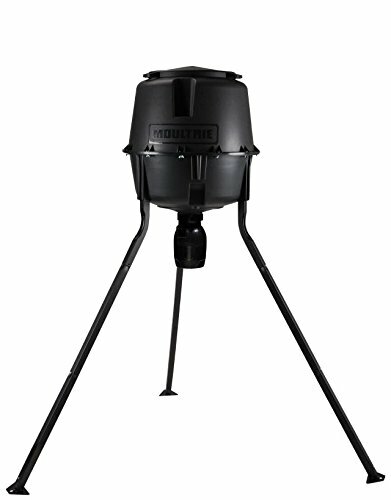 The simplicity of Moultrie quick-lock system allows for easy setup, no tools required. Designed to cast feed in a 30-degree path, our directional feeder is ideal for use along roads, ponds, or trails when 360-Degree casting isn't needed. The directional feeder includes a spinner plate with an integral agitator to improve feed flow and break up clumps before they reach the spinner plate, making it ideal for fish feed and other similar textured feed. Digital timer allows for programming of up to six daily feed times with 1 to 20 second duration. To keep you aware of the feeder's requirements there are a battery level indicator, and a feed level estimator for easy monitoring of usage.